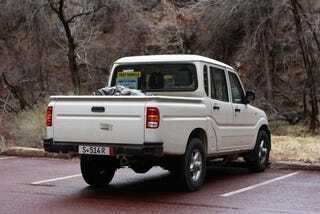 Poll: Mahindra Pickup Spied Again On U.S. Soil — Is It Fugly? Let's get one thing clear: We welcome new vehicle manufacturers. We want to see a diverse selection of cars and trucks on American roads. But it's time for a poll — who out there likes the way this thing looks? This Mahindra pickup was spotted this week near Springdale, Utah, in Zion National Park. As many outlets have reported (often breathlessly, which we don't quite understand), a version of this truck is slated to come to America at some point in the near future. We'd like to get excited — cool Indian weirdness for sale in America! — but frankly, we keep coming back to the questionable looks. Is this thing attractive? What do you think? Be honest. No one is watching, and we won't judge you. Much.